Now there is a much better solution – LightSheer® High Speed DUET™ offers you faster treatment speed and amazing comfort, combined with the safety and the results you desire and deserve. The LightSheer™ Diode by Lumenis was the first system to provide permanent hair reduction using state-of-the-art, high power diode technology. It is a Class IV medical grade device that can be used to effectively treat Skin Types I-IV. We strongly encourage individuals with skin types V & VI to seek out a clinic utilizing a ND-Yag laser for better results in permanent hair reduction. Click on the picture to the right to see how this revolutionary laser system works. The LightSheer™ Diode laser is specifically designed and has the sole purpose of removing unwanted hair and has become the “Gold Standard” for hair removal from its unsurpassed clinically documented success. The patented Sapphire ChillTip™ hand-piece provides continuous cooling of the top layer of the skin for client safety and comfort while increasing penetration of laser energy to the base of the hair follicle. The LightSheer™ Diode has been rated as one of the top lasers on the market by leading professionals in the dermatology & skin care industry and it continues to be unmatched in its clinical research and efficacy. 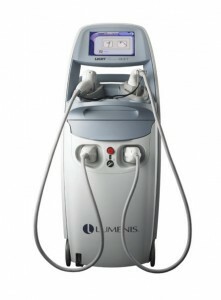 It is important to note that the sole purpose and engineering of the LightSheer™ Diode DUET laser is for hair removal. It is a Class IV medical device – Not to be confused with a Class II medical device known as Pulsed Dye, IPL, or BBL that uses radio frequency and is not specialized for hair removal exclusively. At INFINITY, we have focused on laser hair removal for the past fifthteen years and have become the area’s most experienced laser hair removal centers. With our confidence in our expertise, coupled with the most advanced laser technology available today, we can assure you you are in excellent hands with INFINITY. In order for us to better understand your skin type for the most effective and safe laser hair removal treatment, please consult the Fitzpatrick Skin Type Chart below. This system is based on a person’s response to sun exposure in terms of the degree of burning and/or tanning the individual experiences. For successful removal of hair using the LightSheer Diode technology, it is necessary determine your correct skin type. Please review this chart before your initial consultation. TYPE I: Highly sensitive, always burns, never tans.